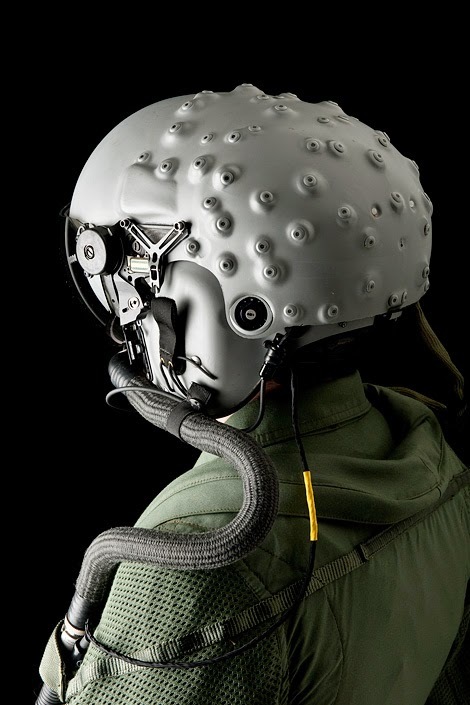 BAE Systems Eurofighter Typhoon integrated Helmet Mounted Display (HMD). "All those bumps on the back of the helmet are IR LED tracking lights. A three-sensor system above the pilot's head follows the orientation of the LEDs, understanding it as the angle and direction the pilot is looking. Both the plane's exterior sensors and weapon systems follow the pilot's gaze in real-time, allowing him to spot, track, lock onto, and fire upon incoming fighter craft and missiles using just his eyes and a few voice commands."